Everyone these days pays at least some attention to sentiment. Which means that the usual sentiment indicators run the risk of becoming saturated with attention, and therefore less effective. Which is why I love finding novel ways of measuring sentiment. 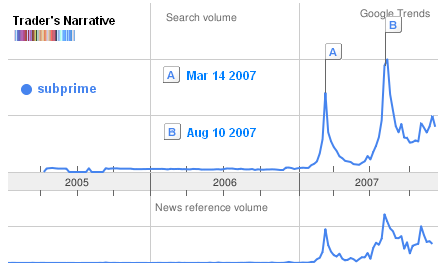 One that I’ve already written about is the “sheeple index” which is a measure of retail broker’s web traffic. Since people would have to be really bearish to even think of typing in such a search string, it may have value from a contrarian point of view. 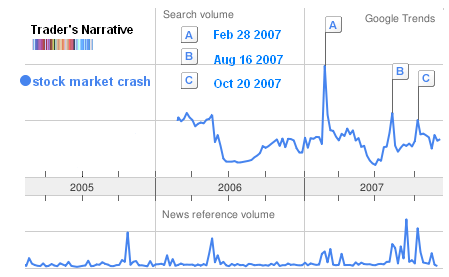 As you can see each time there was a spike high in the number of searches for “stock market crash”, it was a great time to actually go long! Again, note that the two spike highs correpond to intermediate bottoms in the market. What about you? Do you have an unorthodox way of measuring market sentiment? Nothing reliable yet as I haven’t traded while there has been anything other than a bull market in Australia, so am a few cycles short of a theory. I think when new brokers start to pop up everywhere could be a tell-tale sign. I manage money professionally, and I try to keep an ear out for what clients are saying. I also record when they freak out. I think it’s possible to find individuals who can be contrary indicators, but it’s important to keep them in the dark so your source of info isn’t compromised.